Tie down your heaviest cargo and keep it from moving with these chains. 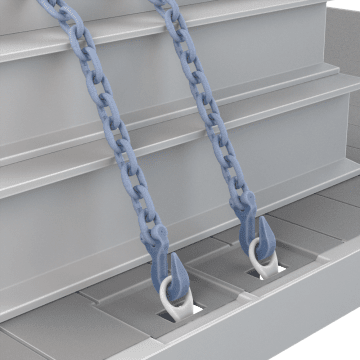 Commonly used in transporting agricultural and heavy industrial equipment, chain is the best choice for cargo too heavy for cords and straps. Chain will not fray and isn't affected by UV rays like straps. They're also referred to as transport chains, and they feature hooks at either end for attachment.